I love taco seasoning. I use it all the time to make lots of Mexican type dinners. I also find it to be a great way to use up chicken. Toss some seasoning and simmer a bit – perfect for a quicky meal. However I recently started paying attention to the sodium in my food. That stuff is in EVERYTHING. I was devastated when I read the back of my trusty seasoning jug. Gulp. Surely there was a way I could get the yummy taco flavoring without all the added salt. Hooray! I found one. This seasoning is every bit as delicious and versatile as the store-bought variety, but you control the ingredients. No salt to be found. 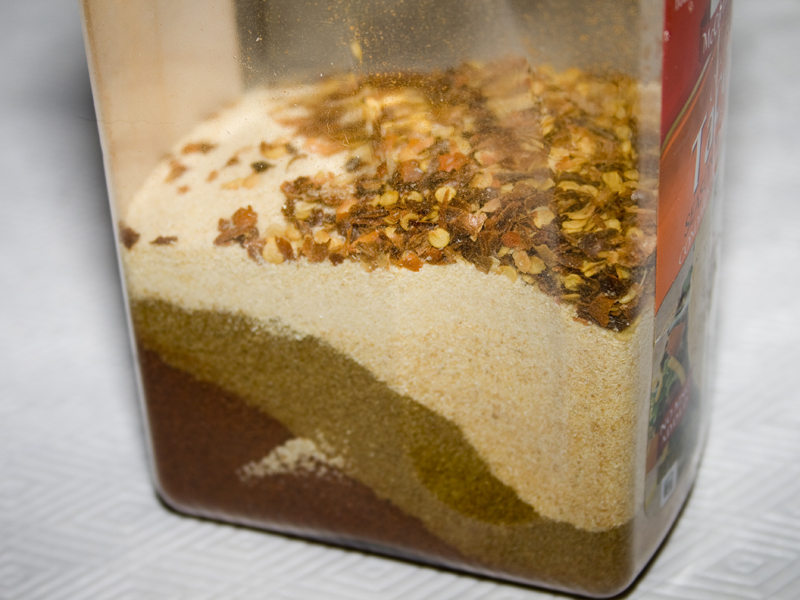 Add your spices to an airtight container. 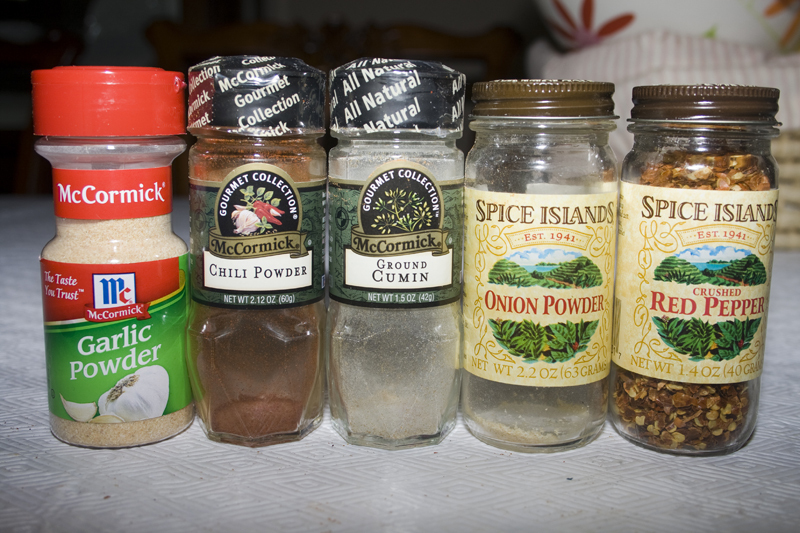 I re-used my old (empty…that’s how much I use this stuff) McCormick container. Shake it up. Looks just like the real thing – huh? Tastes even better! I, too, have to watch my sodium intake. I thought I would have to give up my taco seasoning. Thank you for your recipe. I also want to try your lemon money bread, it just looks sooooo good. I love this taco seasoning!! Do the lemon monkey bread. You deserve it if you’re watching sodium. I checked out your site because of the monkey bread…can’t wait to make it!!! I’ve repinned several recipes and will be back for more. Thanks! Thanks for visiting! Glad you’re finding lots of delicious things! 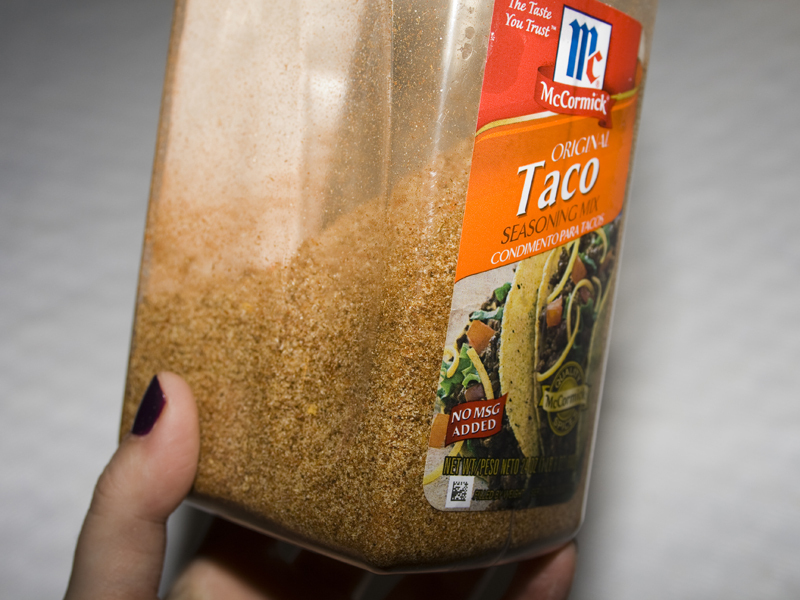 I found your recipe for taco meat seasoning and decided to make it. I went shopping for the spices and as I was making my selections something occurred to me: is the recipe in parts by weight or parts by volume? I suspect there is a big difference in the outcome! How much do you use for a pound of hamburger? I made tacos last week and used your recipe for the seasoning and they turned out fantastic! I like that it didn’t have salt in the recipe because that lets me control how much I use it it. My son said it was better than what I normally bought and used! Hoooray for homemade! Clearly your son is a genius! lol He definitely knows if something tastes good. Hello! Does this one taste similar to the Mccormicks seasoning? I am tired of all the chemicals in it. I’ve been buying the “30% less salt” but it is still not so good anymore. My dad is fussy with taste though and I’m curious as to how this compares. Thanks so much! Have a great day. If you use this and want a similar taste to McCormicks, I’d add salt. I think this tastes better and bolder than McCormicks. Maybe try making a small portion of it and test it out. Let me know what you think! Thank you for getting back to me so fast! I was wondering about the *no* salt. We do prefer SOME. 🙂 However, in all savory cooking I use season salt, which isn’t quite so potent and a little more flavorful. I think I will be making a test batch later this week!!! I will definitely let you know what we think. Tacos are one of our favorite and standby summer meals!